Justice Matthew Begbie: Has the Law Society of BC treated him fairly? Justice Matthew Begbie is one of BC’s best known historical figures, but the Law Society of BC has removed his statue from their lobby. Photo: G.R. Fardon, BC Archives. Justice Matthew Begbie is a larger than life figure in BC’s history, but he was also a man of his times. And the debate over who-from-the-past-should-be-remembered-where (Robert E. Lee, Edward Cornwallis, John A. Macdonald . . .) has now caught up with him. The ‘Hanging Judge’ has been hung out to dry. This spring the Law Society of BC announced it would remove a statue dedicated to ‘The Honourable Sir Matthew Begbie, Lt., First Chief Justice of British Columbia’ from its lobby. That decision passed with relatively little comment, as far as I can recall. Vancouver Sun writer Susan Lazaruk did a fair job of covering the decision in her April 13 article. The Law Society of BC has announced it will remove a statue of Justice Matthew Begbie, who sentenced six native leaders to death before Confederation and became known as BC’s “hanging judge,” because it’s a colonial symbol that offends natives. Go here for the Benchers’ minutes from their April 7 meeting (pages 6 – 7). Lazaruk noted that the removal of the statue was related to implementation of Truth and Reconciliation (TRC) recommendations, quoting from Grand Chief Edward John. John, who addressed the Benchers, is Hereditary Chief of Tl’azt’en Nation and North American representative to the UN Permanent Forum on Indigenous Issues, as well as being co-chair of the Law Society’s truth and reconciliation advisory committee. BC Premier Christy Clark declared the [six Tsilhqot’in] chiefs “fully exonerated of any crime or wrongdoing” in a ceremony in Quesnel, more than 150 years after the chiefs were hanged after they attacked and killed 20 non-natives in a clash known as the Chilcotin War. 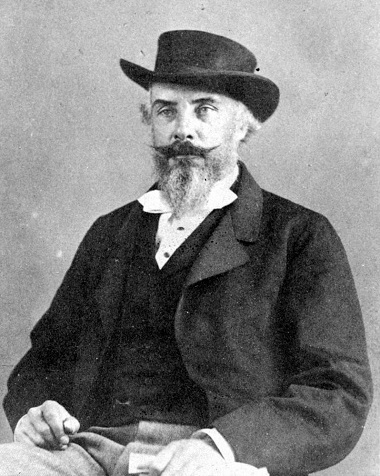 British Columbia’s first chief justice is often called “The Hanging Judge.” In fact, Matthew Begbie was progressive, lenient, championed the rights of indigenous and other minorities exposed to racism, and didn’t hesitate to speak truth to power — in his case, colonial authorities. . . . When the family settled in the Channel Islands in 1826, Begbie excelled in languages and enjoyed mathematics, music and art. He attended Cambridge University. He was a comfortable lawyer when in 1858 he was asked to serve as a judge in British Columbia. American miners from California were causing civil disorder, threatening First Nations, other ethnic minorities and each other with vigilante violence. Begbie proved the ideal man. He was tough, hardy, adventurous, adaptable, fair-minded and determined. He wasn’t popular except with First Nations chiefs, whose rights he frequently defended. [He became fluent in Secwepmc and Tsilhqot’in.] Newspapers launched vituperative attacks. Begbie jailed editor John Robson for contempt of court. . . . The [law] profession’s blue-chip journal, The Advocate, has rallied to defence of the province’s first chief justice. 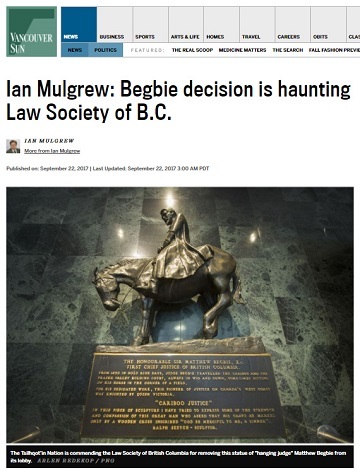 “By removing the Begbie statue from the Law Society lobby, our governing body is now telling us that Begbie’s legacy has but a single dimension which is antithetical to truth and reconciliation,” asserts the magazine that goes to every lawyer in the province. . . . It then proceeds to kick the intellectual stuffing out of the society’s decision – citing the historical record to show the renowned legalist was ahead of his time and a supporter of Indigenous people. Go here for the full Sun article and here for the text of the seven-page editorial. She rejected the argument that the statues should remain because the public can be educated about the dark parts of our past because “it’s pretty hard to tell the story of the Chilcotin War on a plaque” and said there are other ways to educate. With great respect to the intentions of the parties, we think the recommendation to remove the Begbie statue and the acceptance of that recommendation are both misguided. Yale historian John Fabian Witt posited a test for renaming or removing references to historical figures. It was recently modified for a Canadian perspective by Peter Shawn Taylor, editor-at-large of Maclean’s. • First: Is the principal legacy of the namesake fundamentally at odds with Canadian values? This requires a broad understanding of the life’s work of the individual in question. • Second: Was the relevant principal legacy significantly contested during the namesake’s lifetime? Isolated statements or actions considered controversial today may have been conventional wisdom at the time. Context matters. • Third: At the time of the naming, was the namesake honoured for reasons fundamentally at odds with Canadian values? Why was this person commemorated? • Finally: Does the building play a substantial role in forming community? The more prominent the edifice, the greater the case for retaining names of historical significance. If the benchers had been so inclined, how might they have applied the Witt test? We fear that the rush to reconciliation has trampled a principled approach with one unintended consequence being estrangement rather than reconciliation of interested parties. We can hope for a just and reconciling outcome to this situation, but I’m not optimistic. Not too long ago, the Law Society of BC Benchers first approved the TWU School of Law and then caved in to pressure and reversed their course. Clearly the Benchers know how to change their minds, but will they take the time and effort to work through the issues in a just manner? Excellent review. One wonders What the Law Society would make of the Biblical David in an effort to reconstruct and reinvent history and historical facts. Under the Sovereignty of the Creator, all men are created flawed and the second guessing of history is not a helpful arbiter. Perhaps the Law Society and professor would be encouraged to get down from the judgement seat and respect the one True God who created and enabled their armchair forays into refashioning history to conform to contemporary political correctness. President Trump characterizes this as “fake news.” At least it makes for an interesting discussion. The Law Society’s ruling on the Begbie statue is political correctness run amok. It is disappointing that it appears a contextual analysis was abandoned in favour of the flavour of the month, namely, the eradication of history. What the Law Society entirely overlooked was Begbie’s opposition to the government’s desire to give First Nation’s land to white settlers and his defence of the Chinese community against racist legislation, just two examples of his commitment to minority groups.